Utilising both Thunderbolt 3 USB-C ports, add 2 x full-sized USB ports, a Thunderbolt 3 Port, a USB-C port, an SD card slot, a Micro SD card slot and full power delivery support to your MacBook Pro with this adapter in silver. A great adapter with a selection of useful interfaces. Has made it very easy to connect up many non-USB-C devices to my new MacBook Pro. First off, if you have any type of case on your Mac you need to take it off. Also, in order to click my MicroSD card in I need a pin! Then, when I need to take it out I need the pin as well. Returning it when the store opens tomorrow. I'm glad this has been created - in terms of functionality it's great, so I am glad I have it (silly, silly Apple for not sorting this out themselves). The only down side is it feels like it's going to snap off every time I try to insert or remove a USB stick. It needs force to do this (very tight), and the USBC fittings are only small and also located on the far end of the apparatus, so there's a lot of stress placed on them. I have to hold the adapter and brace it if I want to connect/remove a USB stick. The adapter often disconnects if I move around with the Macbook on my lap (it beeps every time the connection cuts). But what can I do - the alternatives are a nightmare to contend with. Great product - a necessity with the new MacBook Pro. Very pleased with the prompt delivery. I ordered 2 of these and have unfortunately experienced connection issues. Constant connection dropouts with the slightest movements & one of the units the HDMI port doesn't work. Sorry to hear you have had problems. It is worth checking the port on your computer to see if there is any weakness there. Strange you are having problems with both of them. If you are still having problems, please contact our Customer Services team so we can investigate further. What a great product. Well designed, well manufactured and functions perfectly; you really could ask for more. The Thunderbolt 3 hub does the job and could perhaps be described as a necessary evil to cope with the hopelessly inadequate USB C ports on the MacBook. The appearance and construction of the real thing is not quite up to the pictures. The casing, described as milled from solid, is fairly flexible and feels a little flimsy. I would not like to give it a good yank by kicking a cable. Most of the essential connectors are there but it's a real shame that there was not a Thunderbolt 2 cable included. A great hub for you MacbookPro, fits perfectly on the side of your computer. Enjoy of a functional piece of hardware that will allow you to connect pretty much anything to your macbook pro. Overall great experience, for this product to be completely perfect I would add a ethernet port but I guess space wise it would've been a bit tight. 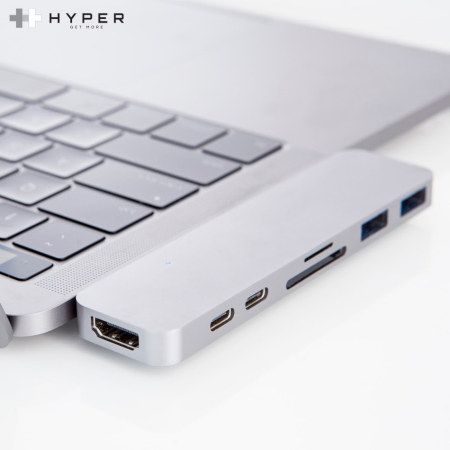 Small, sleek and functional are the words I would use to describe the HyperDrive Compact Thunderbolt 3 USB-C MacBook Pro Hub - Silver. Fits my life style and it has effectively eliminated the need to carry numerous adapters around. Excellent product. I will recommend it any day!!! I could not recommend this product more; it's benefit is huge. Very thankful that I found it. This is a great product as it fits snugly, and allows quick and easy access to dock your Macbook when you return to your desk. I use a shell on my Macbook when I travel, so it would be useful if there was an ability to lengthen the USB-C connectors a couple of millimetres, to save having to unclip the shell to dock.